Ariel’s mouth dropped as she stared at Zak. 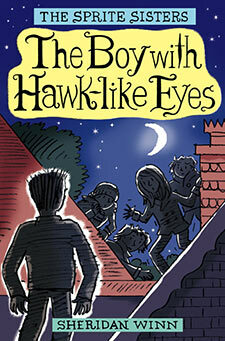 She could feel his hawk-like eyes boring into her and the colour rising in her cheeks. She had been flying over Sprite Towers last night! What should she say? It’s over a year and a half since the Sprite Sisters have used their magic powers of Fire, Water, Earth and Air against Glenda Glass. Amidst much teenage bickering, Flame and Marina are busy with their social lives and even Ash seems to have forgotten her magic. Only Ariel wonders about it. Just as she harnesses her power of Air to learn to fly, a new boy comes to Sprite Towers and the family is threatened by the invasion of terrifying insect-like creatures. With dark magic unleashed in the old house and the air turning poisonous, the Sprite Sisters must quickly find a way to remember their powers.